Amazon and Walmart, the undisputed kings of online and offline retail, respectively, are set to square off once again—this time for dominance over the world’s last remaining major e-commerce market, India. Bengaluru: Back in 2009, the size of the Indian e-commerce sector was less than $50 million and modern supermarket stores were still finding their feet. Amazon.com Inc., the world’s largest online retail firm, had not even started seriously evaluating the Indian consumer Internet story, let alone invest in it. Walmart Inc. had just opened its first wholesale store in India in partnership with Bharti Enterprises, and was still plotting its strategy to open supermarket stores once the South Asian nation allowed foreign investment in retail. Flipkart, founded by Sachin Bansal and Binny Bansal (not related) in 2007 as an online seller of books, was far from a household name. It had just about managed to raise $1 million from Accel Partners India. 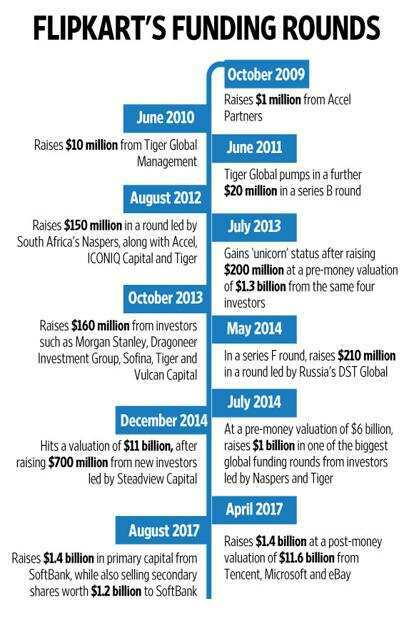 Yet, it was around that time in 2009, that the turning point for Indian e-commerce—and by default, Flipkart—arrived in the form of a hitherto unknown investment firm, Tiger Global Management, and its reclusive fund manager, Lee Fixel. Fixel, at the time, made an outsized bet of $10 million on Flipkart at a valuation of roughly $40 million—which was equivalent to the size of online retail in India at the time. Cut to nearly a decade later, that seemingly outlandish cheque of $10 million has acquired near-mythical status. Since that moment in time, Flipkart has raised well over $6 billion and emerged as India’s most valuable Internet start-up, Amazon has entered India and pumped in at least $5 billion, Japan’s SoftBank Group Corp. has set aside nearly $10 billion for investments in India and India’s consumer internet economy is projected to touch $100 billion over the next decade. And, in a sign of how swiftly things have turned on their head, Walmart, the world’s largest bricks-and-mortar retailer, is in advanced talks to pump in several billions of dollars into India through an investment in Flipkart, according to five people aware of the talks. Separately, Amazon, which operates its own online marketplace in India, has initiated talks to buy a majority stake in rival Flipkart, another two people said. Amazon may soon submit a bid for Flipkart, these people said, while adding that a deal with Walmart is more likely to go through. If Fixel’s initial $10-million investment in Flipkart (since then, Tiger has pumped in at least $1 billion into Flipkart) literally triggered the birth of modern-day Indian e-commerce, Walmart’s proposed investment in Flipkart is set to take e-commerce to the next level and place it well and truly in the global league of Amazon and China’s Alibaba. If a Walmart-Flipkart deal does go through, the battle between Flipkart and Amazon is unlikely to conclude anytime soon over the next decade. At stake will be several billions of dollars in investments from two of the world’s most deep-pocketed companies. On the other hand, if Amazon ends up buying a majority stake in Flipkart, the combination would become India's undisputed No.1 in online retail platform with a global scale. Walmart and Flipkart have held talks earlier as well. Initial talks between the two companies were held in 2016 when Flipkart was struggling to fend off a rampaging Amazon. It had lost significant market share to the American online retailer, which was on an unprecedented investment spree in India. Those initial talks did not lead anywhere, but Flipkart continued to be on Walmart’s horizon in the 18 months since then, especially in light of its mammoth fund-raise last year from investors led by SoftBank, China’s Tencent Holdings, Microsoft and eBay. In two separate tranches, Flipkart mopped up nearly $3 billion—nearly half of the $6 billion that it has raised overall since it started out in 2007. Talks for a Walmart-Flipkart deal resumed in earnest late last year, including key players such as Tiger’s Fixel, Flipkart chief executive officer Kalyan Krishnamurthy, founder-chairman Sachin Bansal and a host of top executives from Walmart, including chief executive Doug McMillon. In fact, Fixel, Flipkart’s biggest backer and key board member, did visit Walmart’s headquarters over recent weeks to help put the deal together. While both Flipkart and Walmart have so far not publicly commented on the talks, there has hardly been any attempt to conceal the fact that these discussions have taken place. Over the past few weeks and months, Walmart executives have met with Flipkart’s major stakeholders—especially Fixel of Tiger Global—and leaders, including CEO Krishnamurthy and founder and chairman Sachin Bansal. According to several executives and employees, top Walmart executives have also visited the headquarters of Flipkart in Bengaluru, as well as Flipkart subsidiaries such as Myntra. Walmart chief technology officer Jeremy King also visited Bengaluru in March and, in an interview with MintAsia, emphasized how India featured as a significant investment destination for Walmart. King, however, declined to comment on Walmart’s talks with Flipkart. MintAsia spoke to more than half a dozen executives, investors and other people connected with the talks for this story. Walmart may eventually end up taking a large stake in Flipkart at a price that could value the Internet retailer between $20 billion and $23 billion. Initially, the American retailer had expressed an interest in buying Flipkart, but a complete buyout became unlikely as key investors such as SoftBank were unwilling to exit Flipkart completely, especially since they came in less than a year ago. According to the executives mentioned above, Walmart will now end up with at least a 51% stake in Flipkart, thus handing it a majority stake at the very least. Walmart’s share in Flipkart could also end up being higher, in the range of 55-70%, if all of Flipkart’s investors participate in the secondary transaction that is expected to value Flipkart at around $15-16 billion. The talks are in advanced stages and the two companies are expected to sign the final term sheet over the next few days and weeks, the people said. Walmart is expected to invest fresh capital in Flipkart as well as buy shares from existing investors, including Accel Partners and Naspers. In any eventuality, Walmart will end up as the largest shareholder in Flipkart. SoftBank, which was initially reluctant to sell any of its over-20% stake in Flipkart, has over the past few weeks relented to part-sell some of its stake in the online retailer. Flipkart, Walmart and SoftBank declined to comment. The Economic Times reported on 31 January that Walmart was in talks to buy a 15-20% stake in Flipkart. In August 2017, Flipkart received a commitment of $1.4 billion in fresh capital from Japan’s SoftBank Group, valuing the online retailer at about $14 billion. The current valuation offered by Walmart includes Flipkart’s fashion businesses Myntra and Jabong, eBay India and mobile payments firm PhonePe. Walmart has been eyeing India’s retail sector for years, but the existing foreign direct investment policy does not allow the US-based firm to have a meaningful presence in the country. It does operate 21 Best Price wholesale stores, but has stayed away from direct retail. Walmart has avoided joining hands with any other Indian retailer since its partnership with Bharti Enterprises ended in 2013. New investors are willing to value the company at a much higher price partly because Flipkart has shown that it is holding its own against Amazon, which has been unable to unseat its local rival as the country’s largest online retailer despite outspending Flipkart, according to experts and company executives at Flipkart and Amazon. Flipkart is also seen as one of the most attractive Internet assets globally, benefiting from the long-term potential ascribed to India’s internet market by investors. If the deal happens, it will pit Walmart against Amazon in India—similar to the fight between the two companies in their home country. The Walmart-Flipkart deal would also mark an important milestone for the effective organization of retail in India. With seven decades of experience behind it, Walmart is expected to bring in global commerce expertise and have a transformative effect on vital aspects of the Indian e-commerce business, such as technology, product development, supply chain and inventory management, according to several experts MintAsia spoke to. “If the deal (between Walmart and Flipkart) does go through, it levels the playing field considerably, from a global perspective. While in India, Flipkart is a massive name, Amazon, which has been around for over two decades, has far greater experience in the e-commerce business and has several billions of dollars at its disposal that it can keep deploying towards India through the next decade or so," said Harminder Sahni, founder and managing director of retail consultant Wazir Advisors. “If the deal goes through, the game changes completely and it essentially becomes a Walmart vs Amazon fight. It becomes a battle of two giants. Both Walmart and Amazon know the retail business inside out; so, it’ll be interesting to see how the endgame plays out," added Sahni. While Walmart’s entry would significantly raise the stakes and give an edge to Flipkart, for Amazon’s India business, it is something that would have already been taken into account by the Seattle-based online retailer, among a list of potential scenarios, according to executives and experts tracking e-commerce. “Amazon wouldn’t have been caught off guard by Walmart’s potential entry into India—it is a situation they would have anticipated when they first entered India back in 2013," said Sahni. The potential Walmart-Flipkart deal would also reinforce confidence in India’s long-term consumer Internet potential—especially on the back of the funding winter of 2015-16, when the investment gold rush in India came to a sudden halt due to a slowdown in Internet growth, spooking investors who wrote far fewer cheques for emerging start-ups and pushed early-stage ventures to focus on the so-called unit economics and sound business models. Amazon founder Jeff Bezos. Amazon wouldn’t have been caught off guard by Walmart’s potential entry into India—it is a situation they would have anticipated when they first entered India back in 2013. “Strategic investments by international players now would be a far higher reinforcement above the last year’s deals to the Indian investment thesis. This can pave the way for many more global players to view this market for strategic entry in e-commerce, retail and logistics space. We had mostly financial investors betting big on India in the first wave," said Sreedhar Prasad, partner (strategy) at KPMG.